I've added a new design to my online portfolios. 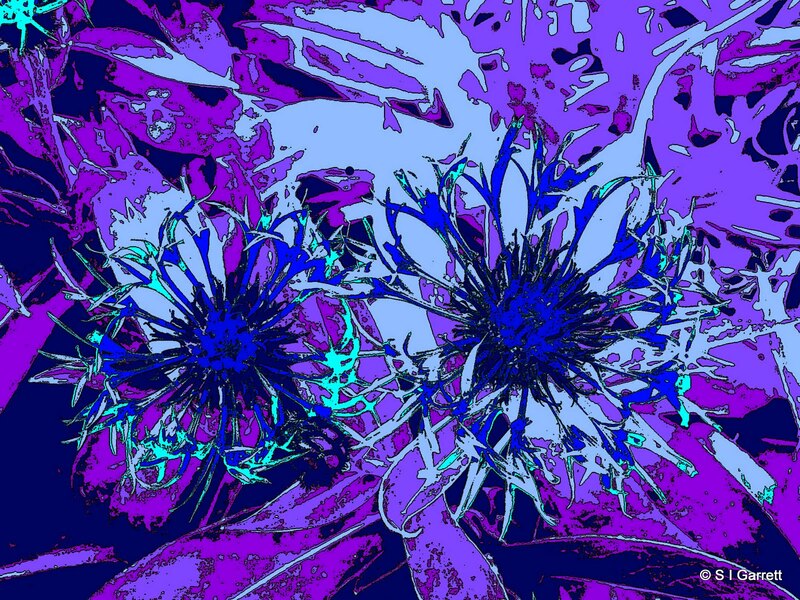 It was based on a photo of a couple of cornflowers . I then had great fun adding effects and changing colours etc. I combined effects using about three different editing applications to end up with this. I chose to use blues and purples as this seemed to be n keeping with the subject. Thank you v. much for visiting my blog... having not posted for quite a while it was nice to have a new visitor... love the cornflowers - we've got quite a few here and great to see how quickly they fill out a space! Have a good week! These ones certainly grow quickly - then they go tatty and mildewy so I cut then back to the ground and soon new shoots appear for a second flush. I'm glad you posted a comment on this blog as most of my commenters visit my other gardening blog.